The Boundary Commission was an instrument of both Great Britain and the USA, so it came under the Foreign Office in England. Because of the Oregon Treaty of 1849, all territory that was called New Caledonia and the Columbia Department was ceded to the US, the boundary placed at the 49th parallel. It was at this point that the North American Boundary Commission was formed to determine just exactly where the 49th parallel was; the Americans sent their engineers, as did the English. The British Engineers were comprised of two units: the water boundary commission and the land boundary commission. Two two men from the water boundary commission were transferred to the land boundary commission: Dr. David Lyle (RN) and Lt. Roche off the HMS Plumper. The Columbia Detachment was headed by Lt Colonel John Summerfield-Hawkins. Underneath him was a mixed bag of officers: Capt R. W. Haig (Royal Artillery), Capt. Darrah (Royal Engineers), Lt. Wilson and (1860) Lt. Anderson. These officers commanded 55 NCOs and Sappers. Roderick Murcheson of the Royal Geographic Society and Royal Geological Society put forth that a body of scientists should accompany the Engineers. Those chosen were: Naturalist and botanist Dr. David Lyall, Royal Navy; geologist Hillary Bauerman, Esq., who would go on to become a fellow of the Royal Geological Society (FRGS); and zoologist John Keast Lord, who was a member of the Royal College of Veterinary Surgeons. The astronomical and geological survey work was done by military officers. The enlisted men, along with Chinese, Native, and European axemen, cut and cleared the boundary the officers surveyed, creating a physical, straight line 20 feet wide, and 400 miles long. Then the scientists, both individually and together, crisscrossed the boundary, doing their assorted scientific surveys. Since I last addressed you on the 19th of Instant, an alarming report reached this place of the murder of 42 miners by the Indians of Fraser's River, and I in consequence, made a requisition on Major Hawkins, Her Majesty's Commissioner for determining the Land Boundary, for an officer and ten men, and for an equal force respectively on Captain Prevost of Her Majesty's Ship "Satellite" and Captain Montresor of Her Majesty's Ship "Calypso", so as to form a force of 33 officers and men to proceed with me to the scene of the disaster. That alarming report has since been contridicted in a dispatch from Mr. Hicks, Her Majesty's Sub Commissioner of Crown Lands, for the district of Fort Yale, who states, that two men only were killed by the Indians, instead of the larger number previously reported. I am nevertheless preparing for an excursion to Fraser's River, with a small military force of 35 men, composed of 15 Sappers and Miners furnished by Major Hawkins, and Lieutenant Jones with 20 marines, kindly furnished by Captain Prevost of Her Majesty's Ship "Satellite"
Major Hawkins has decided on accompanying me to Fraser's River, and will command the military force. The object I have in view by undertaking that journey is the enforcement of such laws as may be found neccesary for the maintainance of peace and good order among the motley population of foreigners, now assembled in Fraser's River, and also practically to assert the rights of the Crown, by introducing the levying of a Licence duty on persons digging for gold, in order to raise a revenue for the defence and protection of the Country. The military force is absurdly small for such an occasion, but I shall make every exertion in my power to accomplish the great object in view, and to assert the rights of my Country, in hopes that early measures will be taken by Her Majesty's Government, to relieve the country from its present perilous state. I transmit for your information the requisition I made on Captain Montresor and his reply thereto. Major Hawkins and his party of Sappers and Miners are rendering the Governor good service. Communicate to the Foreign office as he is under their orders and send a copy to the Admiralty with reference to the aid rendered by Captain Prevost of the Satellite. Acknowledge approving the Governor's measures? The following is a list of the Officers and Men that took part in this pre-emptive Policing expedition on the Fraser River - known to history as the "Fraser Valley War". The Royal Engineers soon returned to their work on the Boundary line. 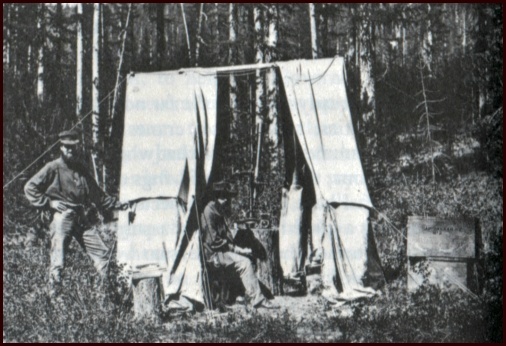 Forty axe-men were discharged at Chilliwack from the Boundary Commission, owing to the mosquitos annoying them so much that they could not work. Two men went crazy through being bitten by them. The range of the thermometer, at the Boundary Commission Astronomical Camp of Capt. Haig, in British Columbia, has been from 26 degrees to 83 degrees of Fahrenheit, within the 24 hours on some days in September. The trail cut by the Commission to the camp, passes over an altitude of 6000 feet, and the country thereabouts is described as magnificently rugged. Colonel Hawkin, Boundary Commissioner, arrived at Panama on the 1st September, with dispatches from Gov. Douglas to the English Government. It will be remembered that this officer left us immediately after the occupation of San Juan by US troops, and doubtless upon his arrival in England a correct statement of the particulars of this outrage will be laid before the Government by him. We are allowed a pint bottle of wine and a bottle of beer per diem when practicable and we generally contrive to keep a supply of them at all hazards. A keg of brandy is generally kept as it is very acceptable sometimes on a cold winter's night when we have to sit up till sunrise observing the stars". "We draw the same rations as the Men as we find that is more then we can manage, namely 1 1/2 lbs. fresh meat, 1 lb. flour, 3/4 lb. potatoes per diem, tho' of cource there is in reality no restriction of quality for the officer's mess. We have been enjoying the luxury of Worcester Sauce and pickles lately, but I am afraid we shall soon be out, unless a reinforcement be sent from Victoria, 100 miles off." "I never tasted such good bread anywhere as our Men make us, they use some chemical composition instead of yeast which I think makes the bread lighter and more palatable." "It was with great difficulty that we stored ourselves away on this boat, as we had so much baggage, and just when we were starting some soldier was found missing, and he was known to have been pretty drunk about an hour before, and they thought he had laid down in the woods and gone to sleep. So they scoured the woods for about 3 hours, and at the end of the time they found him asleep in his own room. So we were delayed about 3 hours, which disgusted us not a little." "We also have the greatest need of 2 surveyors, who would get from 250 to 500 pounds a year and everything found, but nobody has been secured. I am in consequence doing double duty, but I have fortunately 2 or 3 smart young Non-commissioned officers, whom I have been able to instruct a little, and who aford me most valuable assistance. In fact they are as competant to do the work now as I am myself tho' they occaisonally require a little assistance. One of them does most of mathematical calculations for me, tho' of cource he does not understand the why and wherefore of everything. If I were to attempt to explain everything I should have to begin at the very beginning of Arithmetic and Algebra, and turn schoolmaster. It is a great advantage having also my own men around me. If I were to trust to getting civilians as assistants we should get on very slowly indeed." "I have become pretty well settled down in my new quarters (at Colville), a rather small log house, the building of which was a very simple process. A great number of trees being first cut down with the axe then branches are cut off, and then the trees are sawn into logs of required length. They are then placed one on top of the other, and the interstices between the logs are filled up with plaster, and the roof is composed of pieces of wood split up into shapes like slates and arranged in the same manner. The door and windows have then to be cut out of the logs, and a large fire place built inside with bricks. I must not forget to mention too that we are allowed the luxury of a rough kind of floor, and a wooden mantle piece...Leaving out the chimney altogether the size of the room is 17 feet long by 12 feet 6 inches wide. The first thing I had done was to have the logs all scrapped to get rid of the very rough bark outside, which always contains a more or less quantitiy of duct and insects. That being done, I had to set to work to get a carpet, window blinds and window curtains, for I considered that no room could complete without those three things. "I have seven first rate men to assist me in the office, one of the men that I brought out with me being in charge of the rest. Out of the seven five are Scotchmen, one Irishman and the other an Englishman. The latter is a man of good family, having two brothers, one a clergyman and the other a Colonel commanding a regiment, and this man most intelligent and gentlemanly is only a private soldier. I suspect drinking has been the cause of it all, for there are more cases of drunkenness recorded against him than any other man that we have out here. "Nearly all our best men are Scotchmen. The Englishmen are apt to be very independent and the Irishmen are very hasty and fond of a row. The Scotchmen are by far the steadiest, the most careful and respectful set of men, and consequently the most easy to manage. "We have got up a sort of musical society among the Men which seems to please them very well. The band is not extensive, so it is principally solos that are performed as the orchestra only consists of a fiddle, a cirnopian and 3 flutes, and my piccolo is lent when required...We have unfortunately no music, for one of our Men that deserted walked off with a trombone and all the mucic, so they have all to play from ear. They dance hornpipes and all kinds of jigs, and generally seem to pass the evening merrily enough." "On account of the depth of snow on the mountains in the spring, we were obliged to make a tremendous circuit in order to get at the Boundary Line, and our route appears at the point and then we went up to the Boundary Line at Osayoos Lake. It was the place where 3 of our Men were drowned." "All the Men who came out with me with the exception of one are getting on very well. That one deserted at the beginning of the year in consequence of being punished too severely for some thoughtless irregularity. Their serjeant is a great man in authority and is quite independent of all the other sergeants which is a great advantage. He has charge of all the provisions and stores and has no other duty at all to perform. He and the Colonel don't get on very well together, but as scarcely any body does not get on well with the latter it is not to be wondered at. "The man that was my servant is very steady now, and I don't think he has been drunk more than once or twice since he has been out, and luckily for him the Colonel was out of the way at the time or would have been very severely punished. The same man is a photographer, and has been very busy at his profession since he has been out, so that we have a very good collection of pictures of the different places that we have passed." "The Serjeant that I brought out with me is getting on very well, and is very much liked. He has been put in a very responsible position and is quite independent of all other serjeants which is of course a great thing for him. " "The photographer has turned out to be rather an invalid and the Doctor says he ought never to have been sent out. He gave me a great deal of trouble on the passage out, as he was very often drunk, but otherwise very useful. He has not been drunk since he has been here, so I think he intends to turn over a new leaf." "I believe all the Men have turned out well but two, who were corporals and have since been reduced for drunkeness." Observatory tent, Zenith telescope, of the Boundary Commission, at Yahk River station. (10 letters from G. Gibbs, N.W. In March of 1859 when the Boundary Commission was about to embark on the next leg of its work on the 49th Parallel, the commission actually disembarked at Fort Nisqually and used it as a base of operations for a time. The following are a few of the letters that have survived. I have received your note of the 1st Inst. by "George" Sexton, who, arriving today, was sent immediayely to join Sanchez. Sanchez is getting on well with the horses, altho the severe weather experienced during the last week has been against him. I do not think that Mr. Lord will reject any of the horses Sanchez has taken in hand, as he will have none but the stoutest, and best. The horses, having last season, been riden, and excercised in a wheeled machine used for accustoming colts to harness, are more manageable than he seems to have anticipated. Whislt up, they are fed on straw, for which no charge will be made as it would be better that they had oats as well, in which case I would expect government pay for the grain thus expended. Have the goodness to inform me by return of the "Constitution" what you think of this suggestion and its consequent. I desire to have all matters of business between us clearly understood from the outset. Will you require Oats for the Commission? Their present price here is 75 cents for a bushel weighing 34 lbs. Referring to my last of March 7 I have to acknowledge receipt of your's of the 8th. What I inquired about hay was in order that some might be provided for the horses on their passage from Nisqually to Whatcom, but if they go in the "Constitution" direct, much will not be required. According to past progress it will take the men four or five weeks yet to have the horses trained to their liking. I mention this, so that they may be directed, if you desire it, to be more expeditious. Sexton wishes me to inform Mr. Lord that the Government pack saddles will answer well. I am happy to inform you that the muleteers have been getting on well of late with the horses. They have now broken in twenty, and, as several of the nags yet to be moved over to them, are already used to harness and the saddle, they ought to have the number of horses required ready by the first week in April. We can furnish you with 8, moderate sized bullocks, or as many more as you may probably want, in as good condition, as cattle can be found in, at this season, in these parts. The hay I wrote about formerly was merely what I supposed would be needed to fodder the horses on the passage from this to Whatcom. I have received your note of the 18th Inst. and shall attend to what is said therein regarding letting the muleteers do their work thoroughly. I cannot say that either of the men are innattentive to duty, as they employ themselves in bad weather, and when without horses, in making hair lines. I have had occasion twice to warn them against unmercifully riding the saddle-horses, and on my asking Sexton recently, if he had not been told at Esquimalt to consider himself, whilst here, as under my direction, he civilly enough, replied in the negative. Sanchez has refused to take some sound horses 10 or 12 years old, and also some barren mares of good size and young. He has also refused some good young geldings on account of their being in low condition, but, on my recently telling him, that the horses will not be needed so soon as was supposed, he said these geldings would answer. Have the goodness to let me know what you think about the older geldings, and barren mares. Mr. Lord saw some of the geldings, when here, and, if mistake not, approved of them. As mentioned in my last to you, of the 21st Inst. we can supply you with as many moderate sized bullocks, as you are likely to require, when the horses are taken. Owing to the inclement weather and the consequent backwardness of vegetation, the horses and beeves will all benefit by remaining here five or six weeks longer. With kind regards to Captain Haig, and Mr. Lord. Mr Huggins to whom I have read the foregoing says that Sanchez did not refuse the older geldings, having accepted the only one yet presented. What he wishes to ascertain is whether Mr. Lord will ultinmately accept them, and the barren mares? THE BOUNDARY COMMISSION - Col. Hawkins, RE, Her Majesty's Commissioner, with Captain Darrah, RE, and a party of Royal Engineers, may be expected here in a few months, to fix the Boundary posts along the 49th parallel from Semiamoo to Similkameen, the columns having been lately placed in suitable positions for subsequent transport by Captain Gosset, who is also about to erect a handsome obelisk on Point Roberts. Col. Hawkins and his officers will meet with a hearty reception, their active business-like habits having gained them the respect of all classes. It is to be wished that her Majesty's Government, on the completion of Col. Hawkins' present labors, would secure his services in this colony, in such a position as to enable him to bring his experience and talents to bear on our many wants. HER MAJESTY'S GUNBOAT GRAPPLER arrived in this port on Friday last on her way up to the Sumass, with a cargo of Iron posts for the Boundary line. OBELISK AT BOUNDARY BAY - WE are glad to learn that Mr. Ebenezer Brown of this city has been awarded the contract for erecting the obelisk which is to mark the international boundary where it strikes the waters of the Gulf of Georgia. It is to be constructed of gray granite, to be obtained and prepared here. The contract price is $3,500. Hope, BC - 18th October, 1861. When I met you recently at Hope, I took the opportunity of mentioning to you the desire of a man of the Detachment of Royal Engineers under my command, attached to the Boundary Commission, who will shortly be entitled to his discharge on the expiration of his term of Enlistment, to remain in this or the neighbouring Colony on being discharged. The man in question is Corporal William H. Rowling, who has completed a term of service of twelve years, and is now serving for a portion of the prolonged term of two years. He is married, and is a carpenter by trade; and he will I have no doubt make an eligible Colonist. Under terms of the 6th clause of the Army Service Act of 1847, I have the honor to signify to Corporal Rowling's desire to remain in the Colonies under Your Excellency's jurisdiction; and to request your permission for him so to do. It is not clear to me that once permission is necessary in the case of soldiers discharged by indulgence at their own request; - but as on the withdrawal of the Boundary Commission some of the Men attached to it may wish to be so discharged, as a matter of precaution I think it desirable to mention this to you, - presuming that you can entertain no objection to an increase in the number of settlers of this description. Will Your Excellency oblige me with a reply addressed to Colville, W.T. 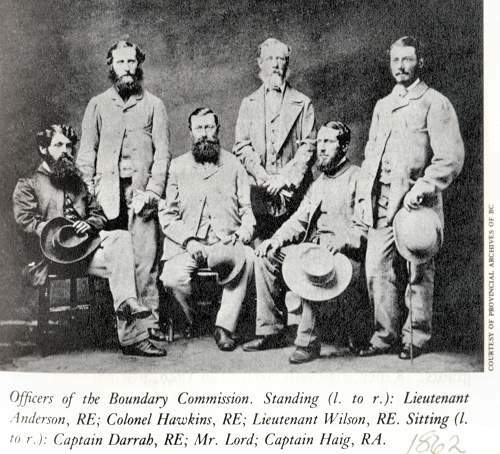 ; and by sending a copy of the portion relating to Corpora; Rowling's application to Colonel Moody; - as it is probable that Corporal Rowling's discharge will have to be made by that officer, as I may not be within reach of a Detachment under Captain Darrah, RE, about to be employed on the Boundary from Semiahmoo eastwards, to which the man is likely to be attached, when the time for his discharge arrives. The work on the Boundary continued until the Winter of 1861-1862. As it was that the existing equipment and supplies had to be loaded and returned to the Commission's base at Pilgrim's Rest, the RE bulk of the Officers and Men were obliged to remain until the Spring of 1862. Colonel Hawkins, endevouring to secure Military Land Grants for his discharged Soldiers, wrote to Colonel Moody. I have the honour to enclose the copy of a letter I have addressed to His Excellency Governor Douglas respecting the privilidge of a per grant of 30 acres of agricultural land in British Columbia, offered to Some of the Non-Commissioned officers and Sappers of the Detachment of Royal Engineers attached to the Boundary Commission, to whom I am authorized to grant per discharge if they wish to become settlers in that Colony. The accompanying letter will, I think, fully explain to you the circumstances of the case; and I hope you will not object to interest yourself in the welfare of discharged men of the Corps although they have not been serving under your command, for doing which your position affords great facilities. As said in my letter to the Governor, it is probable that I shall not be able to do more than discharge the men before I leave the country; and it is further probable that at that time the regulations relating to the grant of land may not be sufficiently mature for immediate application. I have the honour to be etc. As the Spring Thaw of 1862 came on, Men and equipment made their way to Fort Vancouver and eventually to Pilgrim's Rest, Esquimalt, where those Men who wished to purchase their Discharge from the British Army, were allowed to do so. 4943 Sapper Thomas Avery, 4 years 209 days, One Good Conduct Badge, Discharged Esquimalt, V.I., 24th May 1862, Compensation 35 Pounds Sterling. 3815 Sapper William Bentley, 2 years 287 days, One Good Conduct Badge, Discharged Esquimalt, V.I., 22nd May 1862, Compensation 35 Pounds Sterling. 3259 Sapper John Brenton, 6 years 352 days, One Good Conduct Badge, Discharged Esquimalt, V.I., 22nd May 1862, Compensation 35 Pounds Sterling. 5853 Sapper George Bruce, 3 years 173 days, One Good Conduct Badge, Discharged Esquimalt, V.I., 22nd May 1862, Compensation 35 Pounds Sterling. 4884 Sapper Thomas H. Butcher, 4 years 249 days, One Good Conduct Badge, Discharged Esquimalt, V.I., 24th May 1862, Compensation 35 Pounds Sterling. 4918 Sapper William Dingle, 4 years 190 days, One Good Conduct Badge, Discharged Colville, W.T.U.S., 21st April 1862, Compensation 35 Pounds Sterling. 5917 Sapper David Downie, 3 years 89 days, One Good Conduct Badge, Discharged Esquimalt, V.I., 22nd May 1862, Compensation 35 Pounds Sterling. 3289 Sapper Thomas Forgie, 6 years 327 days, One Good Conduct Badge, Discharged Colville, W.T.U.S., 20th March 1862, Compensation 35 Pounds Sterling. 4593 Sapper John Grieve, 5 years 196 days, One Good Conduct Badge, Discharged Colville, W.T.U.S., 21st April 1862, Compensation 35 Pounds Sterling. 4925 Sapper Edward Grove, 4 years 192 days, One Good Conduct Badge, Discharged Colville, W.T.U.S., 21st April 1862, Compensation 35 Pounds Sterling. 5896 Sapper Samuel Howse, 3 years 59 days, One Good Conduct Badge, Discharged Colville, W.T.U.S., 31st March 1862, Compensation 35 Pounds Sterling. 4709 Sapper Thomas Johnston, 5 years 105 days, One Good Conduct Badge, Discharged Colville, W.T.U.S., 21st April 1862, Compensation 35 Pounds Sterling. 2130 Sapper John McTernan, 7 years 161 days, One Good Conduct Badge, Discharged Esquimalt, V.I., 22nd May 1862, Compensation 24 Pounds Sterling. 5925 Sapper James Metcalfe, 3 years 59 days, One Good Conduct Badge, Discharged Colville, W.T.U.S., 21st April 1862, Compensation 35 Pounds Sterling. 4561 Sapper Roger Moore, 5 years 217 days, One Good Conduct Badge, Discharged Esquimalt, V.I., 22nd May 1862, Compensation 30 Pounds Sterling. 4147 Sapper Samuel Passmore, 6 years 54 days, One Good Conduct Badge, Discharged Colville, W.T.U.S., 20th March 1862, Compensation 30 Pounds Sterling. 2850 Sapper Robert Semple, 7 years 71 days, One Good Conduct Badge, Discharged Esquimalt, V.I., 24th May 1862, Compensation 24 Pounds Sterling. 4073 Sapper Timothy Smith, 6 years 83 days, One Good Conduct Badge, Discharged Colville, W.T.U.S., 20th March 1862, Compensation 35 Pounds Sterling.